Geisha (芸者) (or “geiko» (芸子) in the version of the Kyoto dialect) – a woman, entertains its customers small talk, dance, play a musical instrument. Professional geisha are often invited to the gala banquets, dinners and other events where their presence helps create an atmosphere of relaxation and comfort. Maiko – this is the first stage of training for professional geisha. The most common are student girl of 15 years, following years they will have to devote the study of secular etiquette and skills of communication and learn how to entertain guests: master holding a tea ceremony, ikebana, traditional dancing and playing instruments. 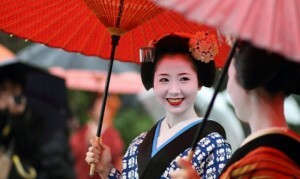 After completion of the course, the most successful maiko can be trained on the geisha. Geisha can be found in many cities throughout Japan, including Tokyo and Kanazawa, but the championship is already more than one century remains of Kyoto. This Kyoto geisha school is considered the most ancient and prestigious. At this point in the ancient capital has 1,000 maiko (students) and 200 geiko. 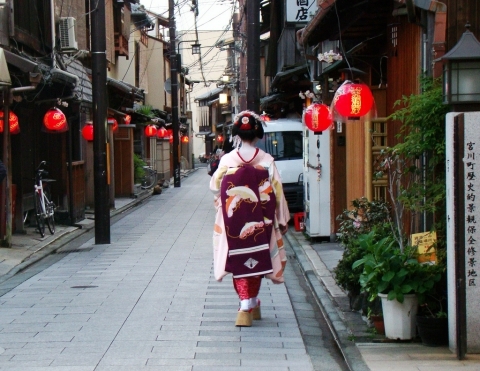 Gion district – the largest and most prestigious district, where there are a Geisha. In Ochaya in Gion is almost impossible to get – in the list of regular visitors is very influential and wealthy people, including foreigners. Unfortunately, the general public is only one opportunity to see geisha or maiko in Gion – when the latter are going to or from work. Also, every year we have the representation Gion geisha «Miyako Odori» (which means “Dance of the cherry blossoms” in translation). The show takes place during the April Theater Gion Kobu Kaburenjo. In Miyagavacho, on opposite banks of the Kamo River, there is a large entertainment district. The main attractions – a few institutions ochaya with geishas and Kabuki large (Minamiza), which are sometimes performances of geishas. 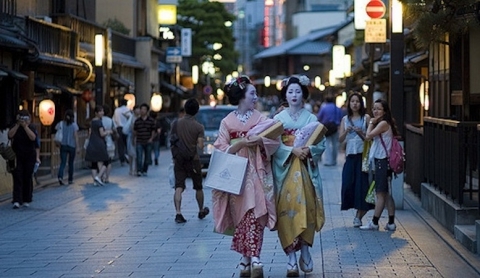 In Kamisitiken employs around 25 geisha and maiko, enjoying the glory of first-class musicians. Selection of tea houses ochaya quite large – about 10 institutions. Pontocho – narrow street, 600 meters long in the place of concentration of nightlife Kyoto to 712 years. Geisha district twice a year in the theater act Pontocho Kaburenjo dancing Kamogawa Odori (Dance of the Kamo River). Okiya – a house inhabited by geisha and maiko apprentice for the duration of the contract of a Geisha. 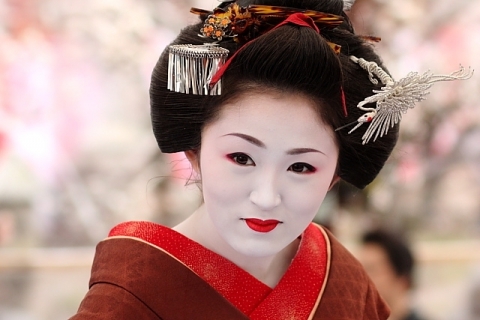 The adoption of the okiya – a first step towards the girl that wants to become a real geisha. Usually okiya contains matron woman who undertakes to pay tuition maiko, and at the end of training serves as manager novoobuchennoy geisha. At the time of the contract, okiya is the only home for geisha and maiko and geisha in the okiya become each other’s family. Ochaya – job geisha tea house. There geisha entertains visitors in a traditional Japanese style: a secular communion, drinks, classic games, singing, playing a musical instrument. As a rule, ochaya not cook, but can be ordered separately with the delivery of lunch or dinner in the restaurant.